PORTAL ZA KICKBOXING NATJECANJA | 19. 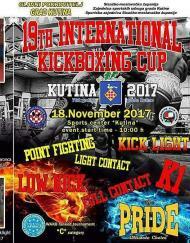 Kutina Open 2017. Odabrano natjecanje: 19. Kutina Open 2017. Informacije za prijave: Till 17th November at 14:00 hours. Double start can be ONLY possible in one sport discipline and one higher age group. We will not accept registrations for two or more age groups.